Canada Day (French: Fête du Canada) is the national day of Canada, a federal statutory holiday celebrating the anniversary of the July 1, 1867, enactment of the Constitution Act, 1867 (then called the British North America Act, 1867), which united three colonies into a single country called Canada within the British Empire. Originally called Dominion Day (French: Le Jour de la Confédération), the holiday was renamed in 1982, the year the Canada Act was passed. 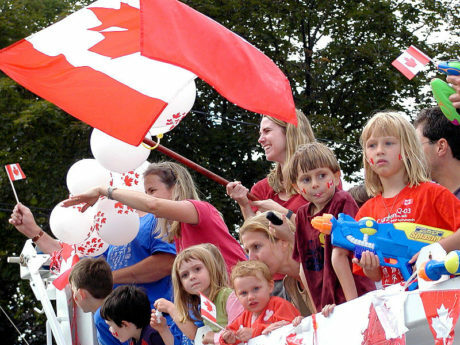 Canada Day observances take place throughout Canada as well as among Canadians internationally. Under the federal Holidays Act, Canada Day is observed on July 1, unless that date falls on a Sunday, in which case July 2 is the statutory holiday, although celebratory events generally take place on July 1, even though it is not the legal holiday. If it falls on a Saturday, any businesses normally closed that day will generally dedicate the following Monday as a day off.